Cold temperatures are moving in tomorrow night and the last thing you want to do is come home to a sight like this. 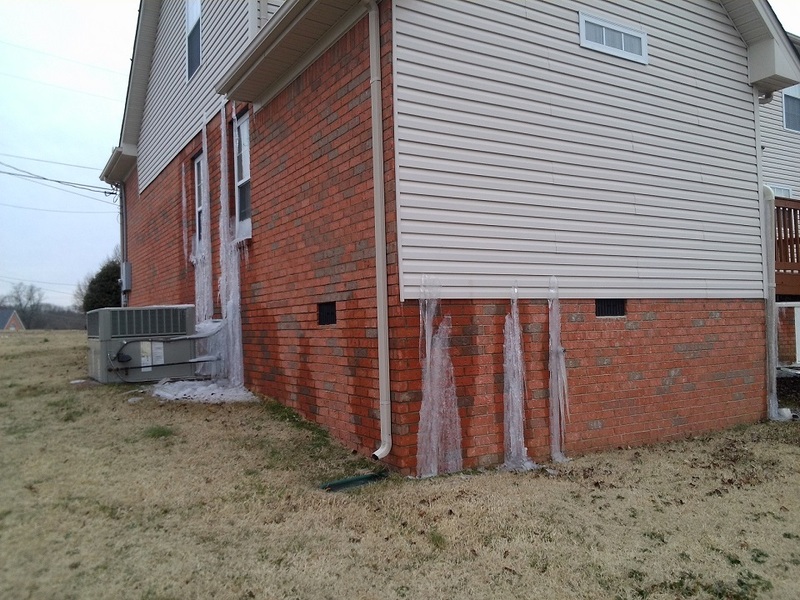 For most residents of Tennessee it only takes a few minutes to get ready and prevent freezing pipes. Here are a few very simple tasks that take just seconds to complete but may save you thousands in repairs! Disconnect hoses from your outside faucets. Many residents don't understand why this is important. Just do it. The short version is that the hose allows water to back up inside your frost proof faucet (inside your wall) and freeze. Damage from this situation sometimes goes unnoticed until you turn the faucet on. While your outside your home is flooding inside. This keeps cold air from blowing under your home. Closing your vents will also help keep your floors warm. Remember to open your vents again in the spring because your crawlspace needs circulation to prevent mold. Let your interior faucets drip. A steady stream is not necessary. Just a slow drip will do. Pay special attention to plumbing fixtures on an outside wall, especially in old homes. And remember to do both hot and cold. Leave your heat on 55º or higher. The home pictured had frozen and burst pipes because the heat was off and the water was on. Yes that is ice from water running out the second floor. There are many other preventative steps you can take, but the ones mentioned above only take minutes and can save you thousands of dollars and a whole bunch of frustration! If you have any questions about owning or purchasing a home in Mt Juliet TN please call Verlyn Steward, The Real Estate Answer Man at 615-394-1823 or send an email to stewardv@realtracs.com.